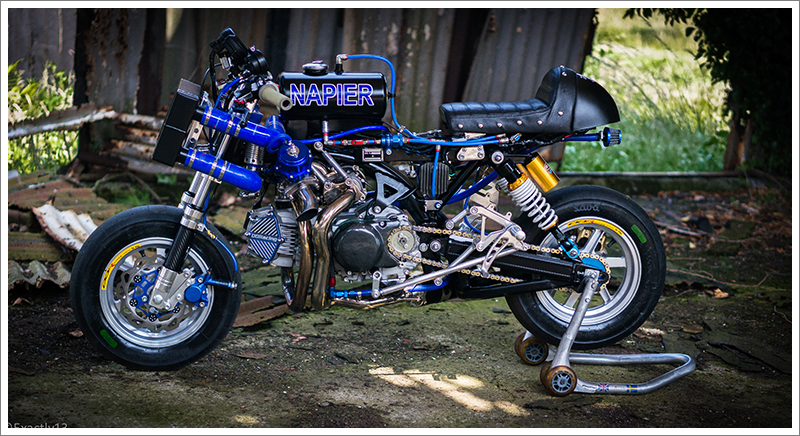 OORacing started on the chassis first which needed to be slightly reworked to accommo­date the top mounted turbo. 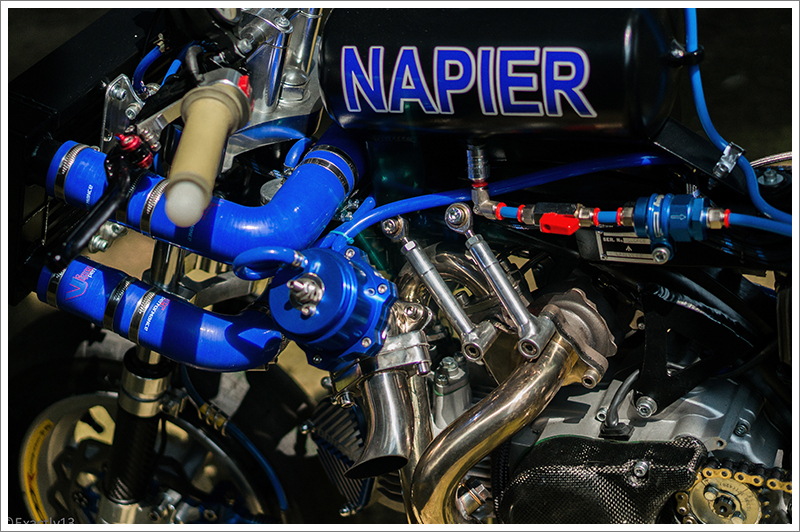 “This was a fairly simple affair that then enabled us to start working on exhaust and induction pipe layouts, which proved to be one of the biggest challenges in the entire project” says Adrian. When you are working with a Monkey there are some real issues, usually in the form of space – there isn’t any. 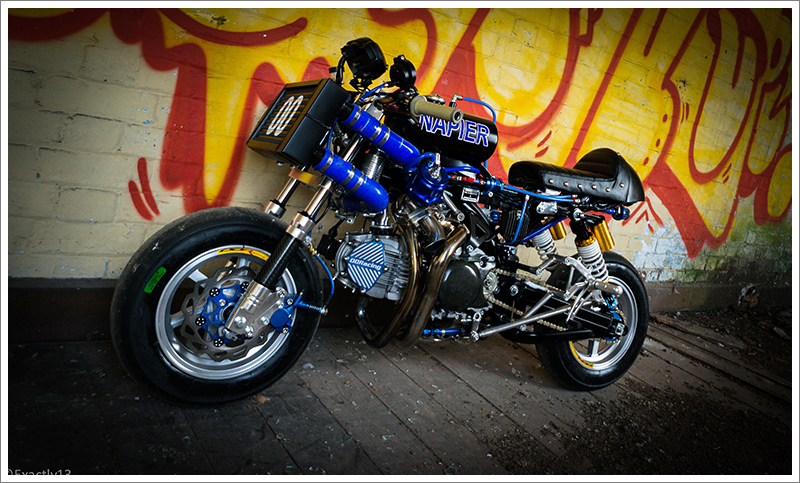 “This is all part of the fun you get when working on such a small bike. A large amount of space was already being consumed by wiring for the ECU, fuel pump, lambda sensor, coil, reg/rec etc. 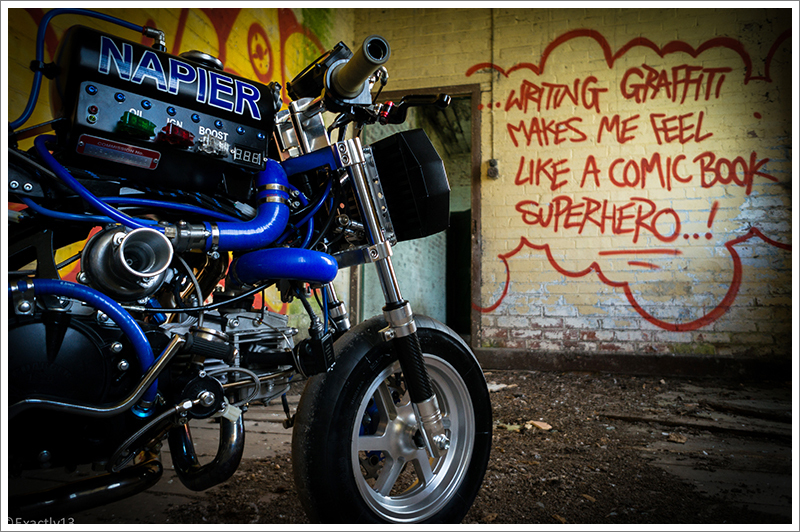 So it left us with little room for piping.” So the guys built a subframe to house the ECU, battery and fuel pump. “Originally the intercooler was side mounted but after some initial runs we quickly real­ised that the amount of heat getting produced by the turbo was not getting cooled fast enough. This led us to mockup a custom intercooler out of a cornflakes packet so we could arrange the pipework and then get a hand built one made by Docking Engineering who did a great job. 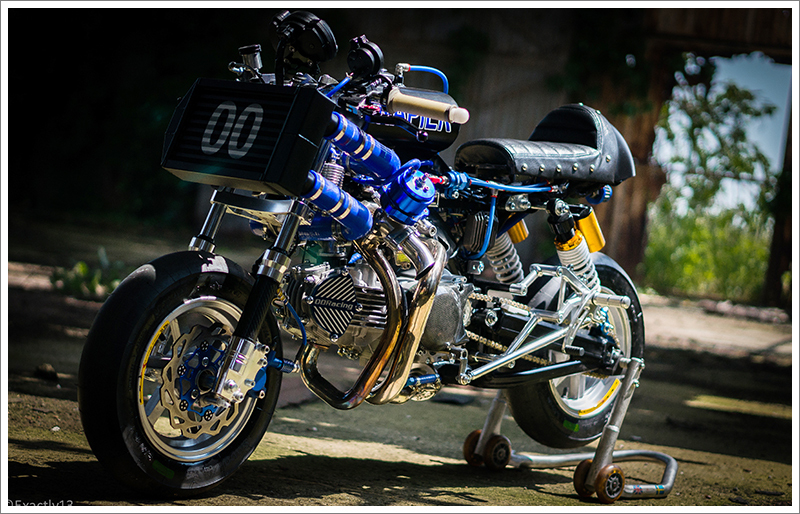 The intercooler is now mounted on the front of the bike so gets the full force of the air when in motion. 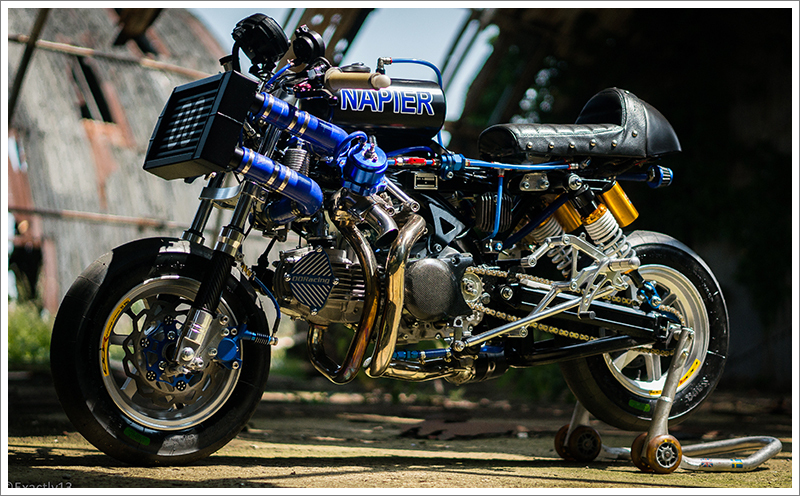 This project has a spec sheet longer than the actual bike – probably twice as long. 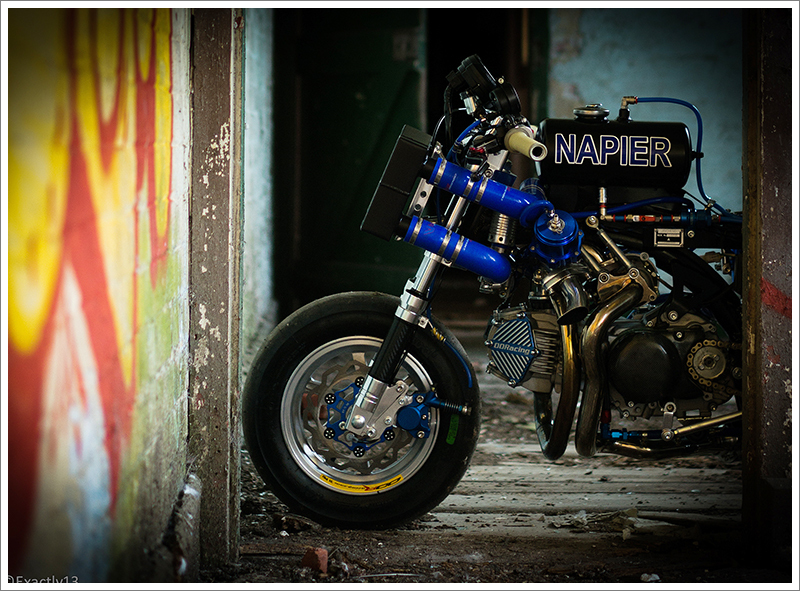 The front forks are custom made OORacing CNC 27mm hydraulic kit with over size 200mm floating disc. The wheels are also custom CNC 10” x 3.50” wide with Sava slick tyres. The full exhaust system was made by Lee Mitchell at Steelheart Engineering and the silencer is hand made based on OORacing Carbon TTR1 system. 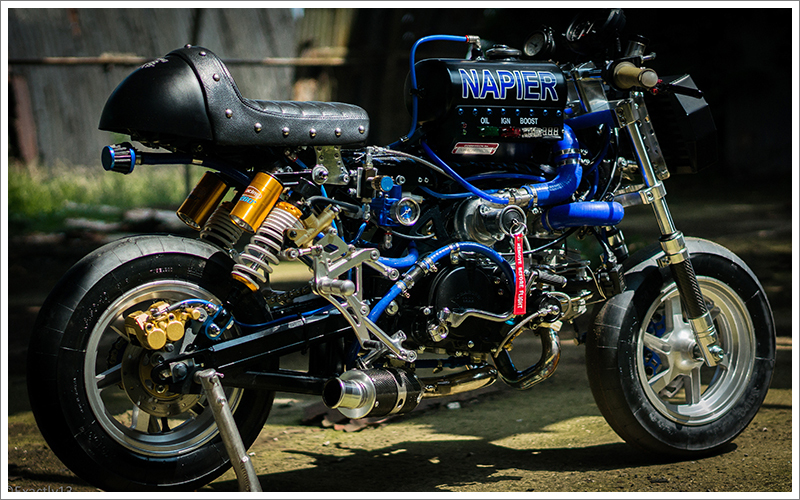 They also made the rear sets with custom made mounting brackets and the Vincent style handle bars. 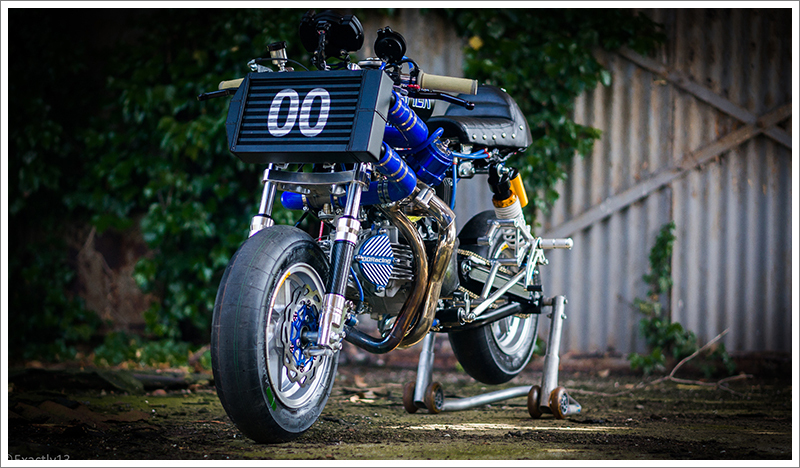 This turbo charged Monkey is currently already achieving close to 100mph in test runs and is producing around 25BHP, however OORacing are confident they can get that figure to at least 33BHP – not bad for a bike that only weighs 75kg. 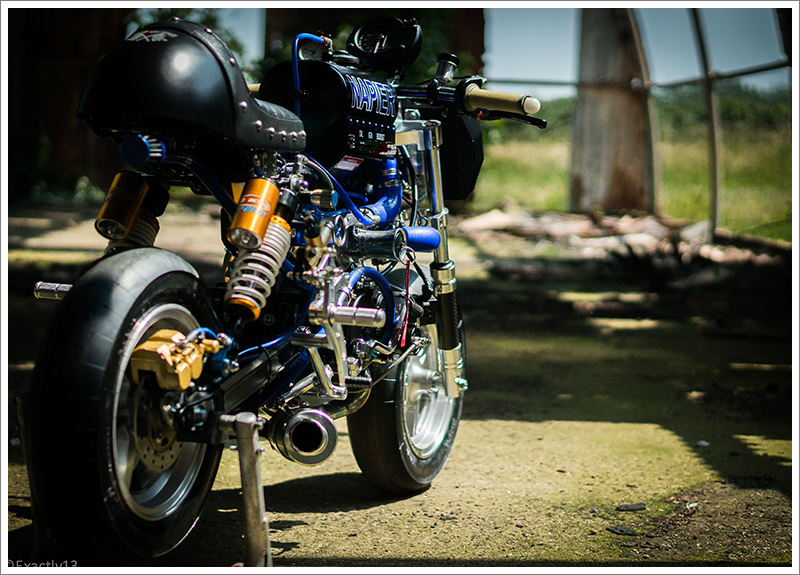 The project has taken them a few years to complete, but the guys at OORacing have learnt alot during the process – which will be invaluable to their Monkey loving clientele. The question now is: what will they do next to the humble Honda Monkey?